I recently had the pleasure of working with Michelle on my debut novel "Mathematics Of Eternity" and was very impressed by her thoroughness, professionalism and timeliness. You can hire Michelle as your editor with complete confidence. I was anxious about what to expect, and Michelle understood that. She provided a generous sample of her work, and we exchanged several emails discussing her editing process. I wouldn’t hesitate to recommend her for your SF/fantasy project. She went above and beyond my expectations. Michelle is professional, thorough, patient, willing to go back and forth on ideas with you, and really cares about her work . I learned an awful lot from her comments and suggestions, and I’m looking forward to working with her on Mathematics Of Eternity 2! Michelle edited my debut novel, Grave Beginnings. Because of her efforts, it went on to win a Best Book of 2015 award, as well as gain me writing fame. 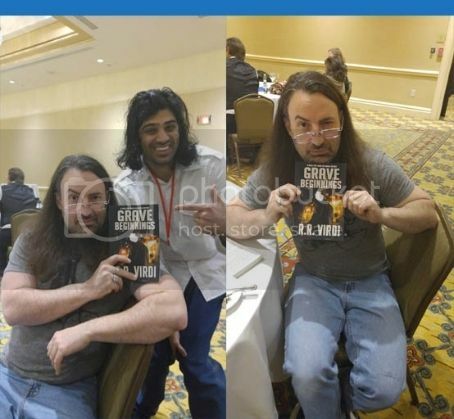 There are pictures of NYT Best Selling Author, Jim Butcher, holding up his signed copy. This is a review of her second editing job on my sequel novel, Grave Measures. How do you think she did after setting me up for success on book one? Wonderfully. Masterful. Perfect. The book debuted with a handful of glowing editorial reviews as well as customer reviews. She does it right every time. I am five chapters in on my edit and my book is already immensely better. I will be using Michelle in the future (if I manage to get anything finished) and strongly recommend her. She is thorough, professional, and very fast. I'm picky (sometimes an editor) and she satisfies that pickiness.